Your wedding date and your location go hand-in-hand, so finding your venue is one of the very first steps you take. Sometimes the choice is obvious but with smaller and more intimate ceremonies trending in 2018, there is going to a growing number of couples using a new set of criteria for their dream venue. While considering season and budget are key, we’ve broken down the main benefits and downsides of popular wedding venues to help you narrow down your options. Timing is everything and the day and month will affect the appropriateness and cost of a venue. Choose a venue at the height of its popularity and you’ll likely pay more. You might have to wait for a date, too. Choose a venue out of season or mid-week, and not only will you not have to wait three years, a venue you thought was out of reach might suddenly enter your budget. Figuring out your total budget from the get go will help you keep your venue pricing in proportion. A good idea is to break your budget up into percentages, with the venue (including hire, cake, catering and DJ/entertainment) accounting for around 40%. By breaking it into percentages, you can adjust other categories as needed. How many people you want at your wedding and who you want at your wedding will ultimately affect your venue. The number of guests affects budget, space requirements, parking, accessibility and more. (No matter your number, add 10% more to account for extras.) Also, specific guests such as elderly grandparents may not be able to travel too far. Taking some time to figure out your overall wedding style is the best way to ensure the end result is a day you will truly love. Knowing your style will also help you move through your plans with a clear and cohesive vision in mind. Look to your home decor and wardrobe. How would you describe your style? Look to your Pinterest board and followed Instagram pages, too. What do the images tell you? Just like everything in life, venues have limitations. Each comes with a list of pros and cons and do’s and don’ts. A venue may be willing to bend some minor rules for you, but part of the process of choosing a venue is accepting the limitations and working within them. To ensure you get the best from your venue, it’s important to consider all different types of venues. It might seem like comparing apples with apples, but there are small differences in each that could make a big difference to your overall experience. One of the major advantages of hosting your wedding in a hotel is that out-of-town guests can stay on the premises. What could be easier at the end of the night than sliding into an elevator and up to your room? Hotels usually have their own wedding coordinator on site too, meaning they go above and beyond to ensure everything runs smoothly. Bigger hotels also have multiple spaces to choose from, giving you options. Experienced staff and built-in accommodations can sometimes be outweighed by a lack of flexibility and hidden costs though. If exceptional food is a priority of yours, a restaurant is a great place to start your search for a venue. This usually brings you excellent service and minimal rentals too. Costs are generally lower with restaurants, as they already have tables chairs, linens and other service items on hand. But space for dancing, live bands and bouquet tossing can sometimes be an issue. As the sun sets golden over a lush vineyard, you’ll know why so many brides and grooms-to-be choose them as a venue. Guests can meander through the glorious grounds while enjoying a glass of wine and perfectly paired canapes. A vineyard makes a spectacular backdrop and our wedding photographers love taking creative photos and videos amongst the vines. There’s a certain rustic charm and elegance to wineries, but bear in mind that you’ll pay a price for such splendour. You may also be restricted in timing, as not all growers will have weddings during growing season. A destination wedding somewhere by the beach is a dream wedding for many. Not everyone can travel for the big day (meaning a smaller guest list and fewer costs) and the quality time you get with guests can make the whole experience a bit more special than a single bash for 200 that ends in five hours. You should, however, consider that some guests feel pressured by a destination wedding and you might need to put your trust in vendors you might not be able to engage with personally. Be it your home, your parent’s home, a friend of the family’s or a home you’ve rented for the week, a home wedding is a great way to capture a sense of warmth and privacy on your big day. If the home has sentimental meaning it can make your wedding feel more personal. A home wedding offers lots of flexibility and savings on things like BYO alcohol. This can be outweighed, however, by the number of rentals you’ll need such as tables, chairs, linens, glasses, cooking equipment and caterers. Parking can also be a problem as can post-wedding cleanup. Historic homes and stately houses often have amazing architecture and a sense of grandeur and timeless romance. There might be some regulations in place to maintain their historic charm, but when you work in with the venue the backdrop can be spectacular. Historic venues have character that you can’t replicate with decor. There are private nooks and crannies for fabulously intimate photography and the story of the building becomes part of your story. Standing the test of time, you’ll likely be able to visit it again each anniversary too. Climate control and mobility-impaired accessibility can be a negative, however, as can technology issues. There’s no need for lavish decorations when you have blooming wildflowers, acres of green hills and an orange, red and purple sunset to wow your guests. Get a glorious day and everyone loves a good outdoors wedding. Get a bad day though and your wildflower wonderland can suddenly turn into a wild and windy disaster. 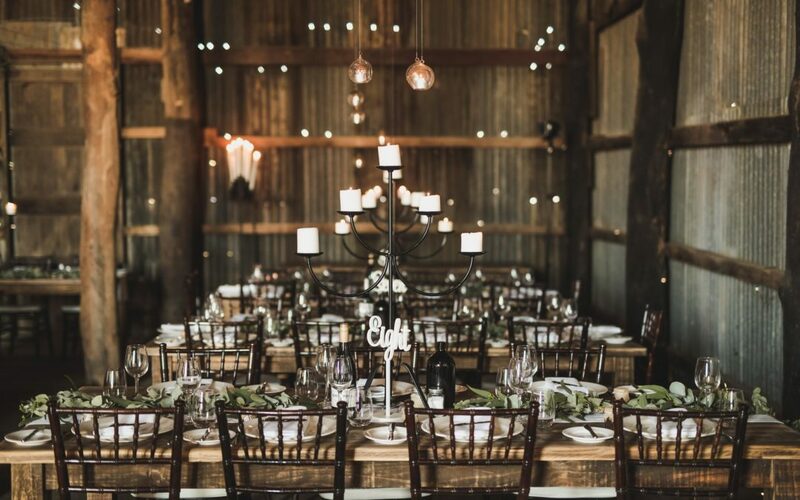 If “rustic” is your wedding style of choice there’s no better venue than a barn or farm. You can keep it simple with hay bale seating and a few flower pots or you can use the money you’ve saved on a big fancy hotel and hire a wedding planner to make the space look magnificent. A farm shed or barn is a blank canvas for you to get creative. We’ll get creative too, using the unique setting to highlight the magic of your special day. The downside is that you’ll need to manage every part of your day yourself. Golf clubs and country clubs are usually one-stop venues where you can get married on the greens or grounds before venturing inside or to the deck for the reception. Being a one-stop venue you can save significant costs and you won’t need to worry about transport between venues. Golf clubs aren’t always the prettiest venues, however, so your decor budget may go up. You’ll also be restricted by the club rules. Many couples choose to host their ceremonies in a religious building – a church, synagogue, mosque, temple or other place of worship. Some of these places of worship have an event space attached, accommodating different types of wedding receptions. A religious ceremony is ideal for couples who want to incorporate their faith in their big day. The framework for your styling and service is all ready to go too. Bear in mind though that if you’re not a member of the place of worship, you might be placed on a waiting list. To make the most of your venue, talk to the team at Perfect Moment. Capturing the joy, tears and laughter takes your wedding from a single day to an eternal memory and we know better than anyone the features of a venue that make for wall-worthy images. Trust the team at Perfect Moment with your special day and no matter what venue you choose you’ll have treasured photos to last a lifetime. Ask about our services and contact us today.